Play On: Jacksonville Jaguars -3.5. Neither of these teams is playing very good football right now, but it’s clear that the Titans have been playing much worse than the Jaguars of late. The Titans have lost eight in a row coming in with five of those losses coming by 14 points or more. They have rarely been competitive, and they seem to have quit on their season. It’s clear that the Jaguars have not quit this season. They have played three competitive games in a row that started with a 25-24 home win over the Giants. They did lose to the Texans 13-27 at home the next week, but that game was more competitive than the final score would indicate. Last week, they went into Baltimore and hung tough for four quarters, eventually losing by a final of 12-20 as 14-point underdogs. Jacksonville has only been outgained by more than 71 yards once in its last nine games overall. That shows that it has been highly competitive over this stretch, actually outgaining three teams in the process. Tennessee has been outgained by at least 50 yards in 10 of its last 11 games overall, and by more than 100 yards a whopping six times. The Jaguars have actually been playing some pretty good defense here of late. They held the Giants to 329 total yards, the Texans to just 304 total yards, and the Ravens to just 312 total yards in their last three games, respectively. I also like that they have stability at the quarterback position as Blake Bortles is clearly getting better as he goes. The Titans have been awful defensively all season. They are giving up 27.9 points and 378.7 yards per game this season, including 30.3 points and 375.0 yards per game while going 1-6 on the road. They are getting outscored by an average of 13.3 points per game on the road this season. They have given up 36 or more points in three of their last four games overall. Tennessee is down to its third-string quarterback in Charlie Whitehurst as both Jake Locker and Zach Mettenberger are out with injuries. It has had no stability at the quarterback position all year. It is scoring just 16.5 points per game while ranking 29th in the league in total offense at 307.9 yards per game. This Jacksonville defense should shut down Whitehurst and company with the way it is playing right now. Jacksonville is 6-1-1 ATS in its last eight meetings with Tennessee. It actually outplayed the Titans in the first meeting of the season, but lost 14-16 on the road and will want revenge. It outgained the Titans 379-290 for the game, or by 89 total yards. Blake Bortles went 32 of 46 passing for 336 yards with one touchdown and one pick in one of his best performances of the season. The Titans are 3-10-1 ATS in all games this season. Tennessee is 1-9 ATS when playing with 6 or fewer days of rest this year. The Titans are 0-7 ATS in their last seven road games after scoring 14 points or less in their previous game. Tennessee is 1-9 ATS off one or more consecutive losses this season. 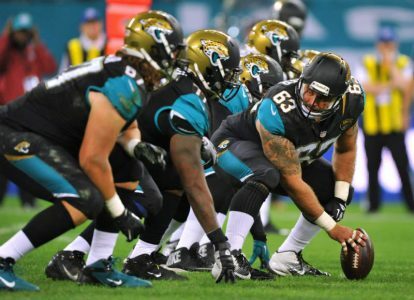 The Jaguars are 4-0-1 ATS in their last five games after scoring less than 15 points in their previous game. Bet the Jaguars Thursday.